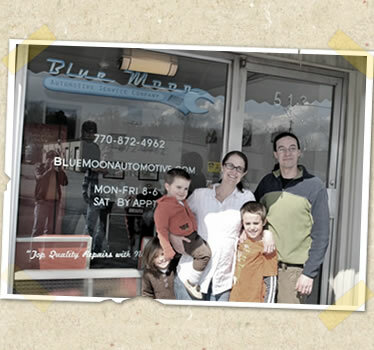 Blue Moon is a family owned and operated automotive service and repair facility. We offer top quality repairs with neighborly service for all Domestic and Asian vehicles. We aim to establish long-term relationships with our customers by delivering the highest quality service through dependable repairs and clear, convenient communication via phone, text message, or email. We also service antique, custom, and collectible cars, trucks, and motorcycles. Whether you want to use it as a daily driver, as a parade vehicle, or to keep your Concours restoration in its original running condition, we can help you ensure that it meets your wants. Blue Moon is owned and operated by Marc and LauraHelen VanWinkle. Marc is an ASE Master certified mechanic with an L1 endorsement. This is the highest level of certification available for cars and light trucks. With 14 years experience and a degree in Electronics and Computer Engineering, Marc is qualified to diagnose and repair even the most complex problems found in modern hybrid-drive vehicles.